The North Island is the slightly smaller yet more populated of the main two New Zealand islands, and Auckland is the largest city. Roughly a third of the entire population of New Zealand lives in Auckland itself. Whereas The South Island is generally seen as the more ‘touristy’, area, The North Island is the cultural capital of New Zealand, where all the big cities and the majority of the Maori remains are located. There are a lot of things to do and see in The North Island and Auckland. Auckland contains something to please any kind of city lover, from bars and restaurants to shopping centres and markets, to art galleries, museums, zoos, sport stadiums and more. Outside the city and into The North Island itself there are plenty of things to keep nature lovers entertained too, such as visiting wineries, trekking up mountains and volcanoes, visiting ancient Maori sites, going on forest hikes and even more. No matter whether you intend to visit The North Island to take in the sites and way of life of Auckland or one of the other North Island cities or you wish to experience The North Island’s more traditional beauty, we here at Travelbag have a deal for you. Our extensive collection covers some of the cheapest hotels in The North Island, some of the most popular hotels in Auckland and some of the absolute best hotels in New Zealand. 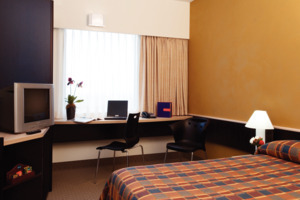 If it’s cheap, convenient hotels that you are looking for then we suggest looking into the Ibis Rotorua, a budget friendly hotel located in the Rotorua region to the South of Auckland in the hot spring region is located in an area that makes travelling to the rest of the island easy and convenient. It is also located in one of the major tourist spots itself, making that one bit of travelling you can avoid entirely! 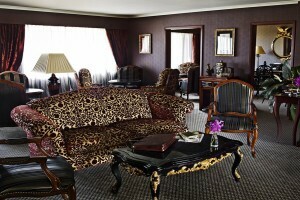 If you’d rather spend your trip in Auckland then we recommend The Langham. The Langham is situated at the edge of the city, however it uses this to it’s advantage. By being further away from the centre The Langham was able to build on a larger amount of land, which it uses to make more luxurious rooms and facilities for the guests. The Langham also compensates for it’s slightly out of the way location by providing a free shuttle bus. Those looking for the best of the best hotels in The North Island will struggle to find better than the Paihia Beach Resort & Spa, one of the more exclusive beach hotels in The North Island. The combination of the coastal views and traditional Paihia town attract a lot of sightseers. Go on a bushwalk. These guided forest tours are so beautiful that they give the Australian Outback that made them famous a run for their money. Go whale watching in Auckland. These highly intelligent animals are regulars of the sea around the city. Visit the East Cape. This region still has a large amount of Maori influence, making it a great place to experience the culture. Go on a tour of a winery. New Zealand is one of the most well respected New World wine producers, famous for Sauvignon Blanc and Pinot Noir. Whatever you choose to do with your time in The North Island and Auckland, book your 2019 or 2020 hotel stay with us today and make sure your accommodation is as memorable as the activities you enjoy while you’re there. Here is just a selection of our favourite and cheapest hotels in North Island & Auckland. Please use our search panel above to find your perfect choice. Located on the picturesque shores of Lake Rotorua and just a short walk from the resort's attractions, local cafés and restaurants, this is a good value for money hotel in an excellent location. The restaurant's 'Grab and Go' menu provides in-room dining as well as being open for breakfast, lunch ... and dinner. Guests also have access to the hotel facilities at the adjoining Novotel. Situated on the shores of Lake Rotorua, this excellent hotel is just a short walk from the resort centre, and adjacent to the thermal bathing pools of the Polynesian Spa. The Millennium enjoys a relaxed atmosphere with many rooms overlooking the lake, and makes a great self-drive holiday base with ... plenty of free parking and easy access to many of Rotorua’s attractions, including Te Puia and Wai-O-Tapu. This contemporary apartment style waterfront hotel has an excellent location nestled on the edge of the Viaduct Harbour amidst numerous restaurants and bars, just minutes from Auckland city centre and leisure activities. The historic Tepid Baths are located opposite and provide a heated pool, spa, sauna, steam room, gym and ... massage (currently under refurbishment, re-opening mid-2012). For great marina views and a spacious balcony, we recommend upgrading to a Marina Deluxe One Bedroom Suite. Located at the edge of the city centre, Cordis Hotel occupies a modern building with traditionally-styled interiors and offers elegant and luxurious accommodation. 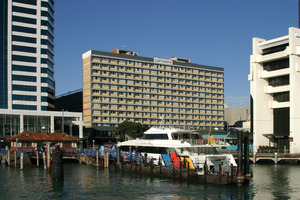 The hotel operates a complimentary inner-city shuttle which departs every half hour to Auckland's waterfront, as well as luxury Lexus hybrid limousines (extra cost). 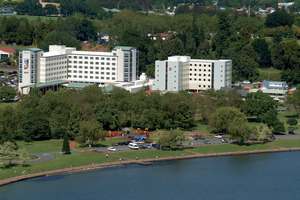 Novotel Rotorua Lakeside lies on the shores of Lake Rotorua, just moments from the city centre. The contemporary guestrooms are spacious and comfortable, and facilities also include an indulgent spa, geothermal heated pools and nightly performances at the Maori cultural centre. 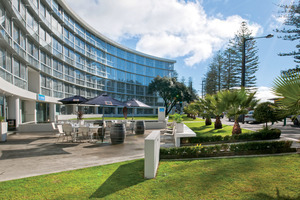 Just a short stroll from Napier's famous Art Deco-style town centre, the Scenic Hotel Te Pania has a prime waterfront location in this beautiful seaside city. Suites feature a separate bedroom and living area, whilst all guestrooms have floor-to-ceiling windows with stunning ocean views. The hotel's popular Exchange Bar & ... Brasserie is minimalist in style, bustling and ideal for breakfast, a light lunch or an al fresco dinner. 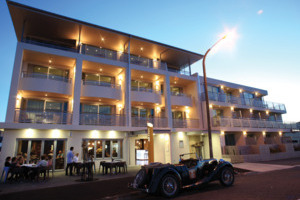 The Crown Hotel is located in Port Ahuriri, a rejuvenated waterfront district of warehouses, loft apartments and trendy places to eat and drink, just five minutes' drive from Napier. The hotel's mix of architectural elements creates a unique blend of history and contemporary style. Choose from the suites located in ... the original 1932 heritage building, or the studios, apartments and premium rooms in the modern annexes. 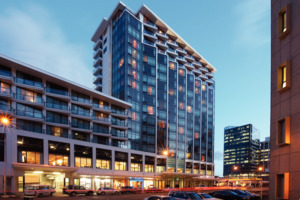 Occupying one of the finest locations in Auckland, the Copthorne Harbour City is situated downtown on the waterfront, adjacent to the vibrant Viaduct Basin's bars and restaurants, and just a short walk from the city's shopping areas. All of the beautifully appointed guestrooms benefit from magnificent panoramic views of the ... Viaduct and the sparkling Waitemata Harbour. 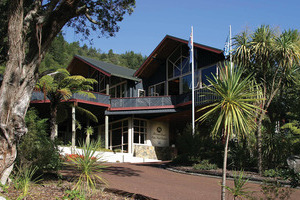 Breakers Motel is a great base for exploring the Coromandel Peninsula, just two hours' drive southeast of Auckland. Whangamata offers safe swimming, surfing and fishing, whilst bordering forests that are great for walking and mountain biking, with short trails leading to isolated beaches well worth discovering. Although Breakers has no ... evening dining facilities, Whangamata has many open air cafés serving everything from Italian through to specialist vegetarian. 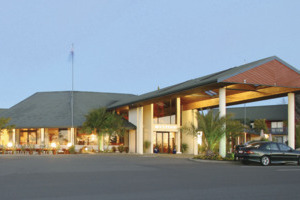 The Copthorne Hotel & Resort is situated on the historic Waitangi Treaty Grounds where, in 1840, the British & Maori signed the founding document of modern New Zealand. It's just two minutes' drive from the wharf and all the attractions of the charming resort centre of Paihia, to which you ... could walk or catch the hotel's shuttle. 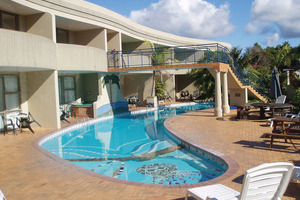 The Copthorne enjoys the clear waters of the Bay of Islands on three sides and offers a fantastic landscaped complex of inter-connected swimming pools. 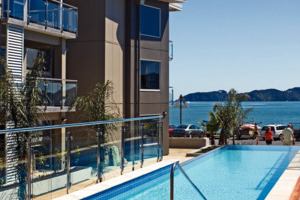 Edgewater Palms has an unbeatable waterfront location, right opposite the golden sands of Paihia's beach, with the resort centre just a 600-metre stroll along the seafront. The modern apartments are designed in contemporary style, and are finished with many of life's little luxuries, including underfloor heating in the bathrooms, walk-in ... wardrobes, top-quality bed linens and retro-style chrome floor fans. This secluded hideaway is situated on Mount Pauanui on the Coromandel Peninsula, within two hours' drive from Auckland. The stylish chalets are hidden amidst lush native bushland and offer complete privacy. 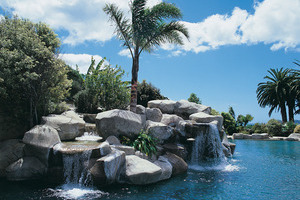 Grand Mercure Puka Park is a ten-minute walk from a golden sand beach, and 30 minutes from Hot Water ... Beach. The popular Ibis offers a great value-for-money base right in the heart of Wellington, with all of the city's key attractions within easy walking distance. The 'Vivant!' restaurant and bar at the Ibis captures the city's buzz. 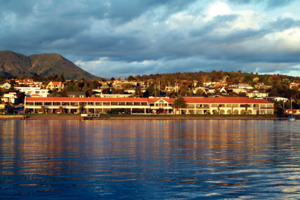 Lakeland Resort is situated on the beautiful shores of Lake Taupo, New Zealand's largest lake. The tranquil setting amidst 2.8 acres of landscaped grounds is only two miles south of the Taupo township and boasts magnificent scenery. This resort provides relaxing and comfortable accommodation, with The Lakeland Bar & Brasserie ... offering a selection of set dinner menus as well as a delicious à la carte menu. This is a Mediterranean-style hotel on the shores of beautiful Lake Taupo, with fantastic views (and magical sunsets) across the lake to the mountains. All our featured guestrooms have uninterrupted views of the lake and you can choose to relax in the cave-like Jacuzzi, complete with fake stalactites and a ... waterfall! This exclusive spa resort enjoys a beachfront location and lies just a few minutes’ stroll along the waterfront from the historic Paihia township. 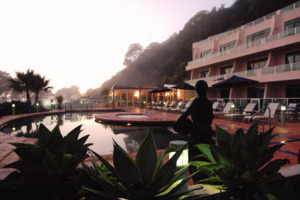 Winner of the 2010 World Travel Awards for New Zealand’s Leading Spa Resort and the 2011 World’s Luxury Spa Awards, the resort offers a heated swimming pool, ... four Jacuzzis, full menu of spa treatments, plus an award-winning restaurant on site. 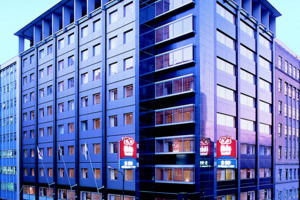 Rydges Wellington, formerly the Holiday Inn, enjoys a convenient downtown location on Featherston Street, opposite Wellington's main railway station and in a central position that's handy for Custom Quay and the Lambton Quay shopping quarter. 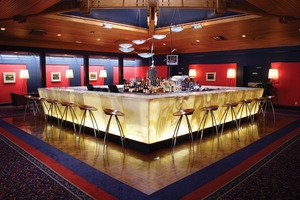 The hotel's funky 'Plate' bar is popular with the after-work crowd. 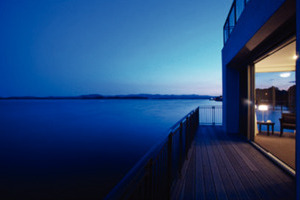 Built across three overwater piers on Tauranga’s waterfront, this contemporary hotel has been designed to take advantage of wonderful views across the harbour to the beach resort of Mount Maunganui. It’s just a short stroll from the town centre, and a scenic drive along the Pacific Highway from Auckland.